Board a Volvo bus from Delhi for Manali. Overnight journey to Manali. Breakfast and then check-out for Hidimba Devi Temple, Vashisht Temple, Monasteries, Manu Temple and club house. Get back to hotel for dinner and all night stay. Breakfast. Then get ready for a visit to the Rohtang Pass, Manali, Lahaul-Spiti valley etc. Enjoy a heartful dinner at the hotel followed by an overnight stay. Have a scrumptious breakfast. Enjoy full day sightseeing of Manikaran. On the way visit Kasol Valley, Kullu and Angora rabbit Farm. Get back to hotel for overnight. Check-out for Shimla by Deluxe Bus after breakfast. Arrival at Shimla and check-in at hotel. Explore Ridge, Lakkar Market, Church and Mall Road. Have dinner at the hotel followed by overnight sleep. Breakfast. Check-out from hotel. Catch a Volvo Bus. Departure. 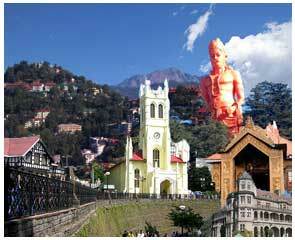 •	One full day Sightseeing of Shimla& Kufri by Alto / Indica car. •	02 Volvo tickets from Shimla- Delhi. •	02 deluxe bus tickets from Manali-Shimla. •	Fruit Basket on arrival. •	01 Night Candle Light Dinner in Manali. •	01 Night Flower Bed Decoration in Manali. •	01 Night Honeymoon Cake in Manali. •	Kesar Badam Milk in Manali. - Any domestic or international Air fare. - Medical and insurance of any kind. Any expenses arising out of unforeseen circumstances like flight delay/cancellation/hike in fare, strike or any other natural calamities. Dedicated to Devi Hadimba (wife of Bhima), the temple was erected in the year 1553. The wooden temple is situated in the middle of a forest known as Dhungiri Van Vihar. It is a unique medieval structure built around the 1460 AD under the reign of Raja Sidh Singh of Kullu. Built in the western and Himalayan architectural style, the castle is a must see for travelers in Manali. The Manali Gompa is a famous 1960's monastery that attracts monks & Buddhists from different regions of the state like Kinnaur, Lahaul & Spiti, Tibet, Ladakh and Nepal. Far-famed for its wall paintings, Chortens and statue of Lord Buddha, the The Gompa is highly visited by travelers. The village of Vashisht is famed for its hot sulphur springs and is also home to the famous temple that was made in honor of sage Vashisht and Lord rama. Manali is home to three Tibetan monasteries that have been constructed recently in the region. Manali wildlife sanctuary is snuggled in the astounding region of Manali and houses numerous wildlife species of flora and fauna. Solang Valley is one of the most famous attractions of the region. One can enjoy a picnic here or bask a visit to its ski slopes. Paragliding is one of the major activities enjoyed here by an array of travelers. 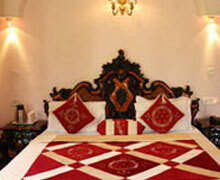 Kothi is an idyllic village that boasts picturesque views of the deep-down gorge. You can also enjoy a visit to the traditional village here and get in touch with the lives of the villagers. The temple was erected in honor of sage Manu, who is believed to be the divine creator of the human race. It is said that it was here that the sage dwelt and meditated. Situated at an elevation of 3980 m, the Rohtang Pass is an awe-inspiring site. It is opened from June to November each year and is a must see for every backpacker who wish to witness the unequalled beauty of the state. 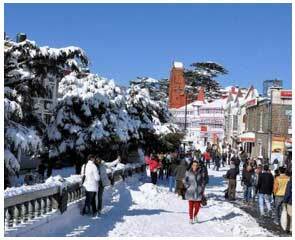 The Mall Road is the hub of Shimla that is highly visited by numerous tour enthusiasts. 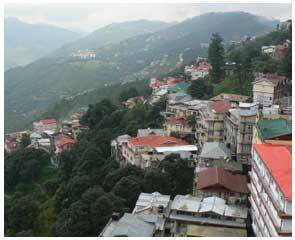 One can find numerous restaurants, Post Offices, clubs & bars at the Mall Road, Shimla. Being the second oldest church in northern India, Christ Church is highly revered and is famous for its stained glass windows. Jakhu Hill offers an astounding view of the region. The hill also houses a famous temple dedicated to Lord Hanuman. Opened in the year 1974, the Shimla State Museum showcases various Pahari paintings, wood-carvings, sculptures, costumes, textiles and jewellery of the state. Erected in between the year 1884-88, the Indian Institute of Advanced Study was originally built as the residence of the viceroy of the then times. Summer Hill is located at a height of 6,500 ft on the famous Shimla-Kalka railway line. It was here that the “Father of the Nation”, Mahatma Gandhi lived in during his Shimla visits. Situated at an elevation of 6,117 ft, Annandale is a beautiful ground that comes under the Indian Army. Tara Devi hill is home to the Tara Devi temple made in honor of Goddess “Tara” that literally means goddess of Stars. Designed by Henry Irwin, a famous English architect the gaiety theatre is a magnificent piece of gothic style of architecture. The theatre rooms are acoustic with special seats designed for Viceroy, Indian Rajas and Army officers of those times.